Aleppo, a city where Jews and Muslims had lived together for centuries, exploded with anti-Jewish violence. Mrs. Abadie, now 88, remembers watching attackers burn prayer books, prayer shawls and other holy objects from the synagogue across the street. She heard the screams of neighbors as their homes were invaded. "We thought we were going to be killed," she says. The family fled to nearby Lebanon. Mrs. Abadie left behind all she had: clothes, furniture, photographs and even a small bottle of French perfume that she still misses, Soir de Paris—Evening in Paris. A group of Yemenite Jews, newly arrived to Lod, Israel, in 1948 after being airlifted en masse. The Abadie family's story is moving from the recesses of history to a newly prominent place in the debate over the future of the Middle East. Arab leaders have insisted for decades that Palestinian refugees who fled their homes following Israel's creation should be allowed to return to their former homes. Now Israeli officials are turning the tables, saying the hardships faced by several hundred thousand exiled Arab Jews, many forced from their homes, deserve as much attention as the plight of displaced Palestinians. "We are 64 years late," says Danny Ayalon, Israel's deputy foreign minister. "The refugee problem does not lie only on one side." Mr. Ayalon, whose father is an Algerian Jew, led a U.N. conference last month sponsored by Israel and dubbed "Justice for Jews From Arab Countries." Life changed dramatically by 1948 as Arab governments declared war on the newly created Jewish state—and on the Jews within their own borders. At the U.N., an Egyptian delegate warned that the plan to partition Palestine into two states, one for Jews and one for Palestinians, "might endanger a million Jews living in the Muslim countries." 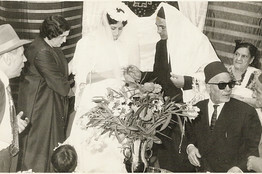 Wedding of Mamus and Dora Rumani in Benghazi, Libya, circa 1955. Jews began fleeing—to Israel, of course, but also to France, England, Canada, Brazil, Australia, New Zealand and the U.S. Yemen was home to more than 55,000 Jews; in Aden, scores were killed in a vicious pogrom in 1947. 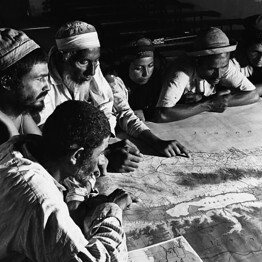 An airlift dubbed "Operation Magic Carpet" relocated most Yemenite Jews to Israel. In Libya, once home to 38,000 Jews, the community was subjected to many brutal attacks over the years. In June 1967, there were anti-Jewish rampages; two Jewish families were murdered—one family clubbed to death—and schools and synagogues were destroyed, says Vivienne Roumani, director of the documentary "The Last Jews of Libya." "We were there for centuries, but there is no trace of Jewish life," she says. Among the Jews forced out of their homes was my own Egyptian-Jewish family, departing on a rickety boat in the spring of 1963. Egypt had once been home to 80,000 Jews. My parents, both Cairenes whose stories I chronicled in two memoirs, were especially pained at leaving a country they loved, without being allowed to take money or assets. Within 25 years, the Arab world lost nearly all its Jewish population. Some faced expulsion, while others suffered such economic and social hardships they had no choice but to go. Others left voluntarily because they longed to settle in Israel. Only about 4,300 Jews remain there today, mostly in Morocco and Tunisia, according to Justice for Jews From Arab Countries, a New York-based coalition of groups that also participated in the U.N. conference. Many of the Palestinians who fled Israel wound up stranded in refugee camps. Multiple U.N. agencies were created to help them, and billions of dollars in aid flowed their way. The Arab Jews, by contrast, were quietly absorbed by their new homes. "The Arab Jews became phantoms" whose stories were "edited out" of Arab consciousness, says Fouad Ajami, a scholar of the Middle East at Stanford's Hoover Institution. "We are talking about the claims of the Palestinians," he says. "Fine, but there were 800,000 Arab Jews, and they have a story to tell." Palestinians bristle at the effort to equate the displacement of Arab Jews with their own grievances. Hanan Ashrawi, a member of the Palestine Liberation Organization's Executive Committee, says Mr. Ayalon "opened up a can of worms for political purposes" with the U.N. conference. She says that Israeli officials are trying to use a "forced and false analogy…to negate or question Palestinian refugee rights." The Palestinians, she says, "have nothing to do with the plight of the Jews or other minorities who left the Arab world." Still, Dr. Ashrawi recently proposed that Arab Jews should also have a "right of return" to the countries they left. At the U.N. conference, Mr. Ayalon called Dr. Ashrawi's suggestion to have Jews return to Arab countries "totally ridiculous." Mr. Ayalon and the Israeli government are pushing ahead with efforts to raise the profile of Arab Jews. Israel has pledged to establish a national day in honor of Arab Jews and build a museum about their lost cultures. Mr. Ayalon has decided to make the Arab-Jewish refugees part of any negotiations, which has never been the case before. Looking ahead to a settlement, he would like to see both Palestinian and Jewish refugees compensated by an international fund. Meanwhile, the Israeli ambassador to the U.N., Ron Prosor, has called on the U.N. to research the refugees' history. Mrs. Abadie attended the conference with her son Elie, now a physician and rabbi who leads Congregation Edmond J. Safra, a Manhattan synagogue attended by Lebanese and Syrian Jews. Until 1947, Syria had an estimated 30,000 Jews living in Aleppo and Damascus. But like Mrs. Abadie, many departed in the wake of the violence that left 75 dead and synagogues in ruin. The Abadies were refugees twice. After leaving Aleppo, the family ended up in Beirut, Lebanon. For a time, life was good in the cosmopolitan city. But by 1970, the climate had turned hostile. Armed militants appeared in the streets. Rabbis, including Elie's father, Abraham, had their pictures posted in the city's mosques, identifying them as "Zionist-Jewish leaders," an act the family took as a death threat. The Abadies decided once again it was time to move. Some Jewish refugees, like Sir Ronald Cohen, find hope in the new initiatives to call attention to Arab Jews. Mr. Cohen, a London-based businessman, was a student at a French Catholic school in Cairo in 1956, friendly with his Muslim and Christian classmates. His father owned an import-export firm that specialized in appliances, and "Ronnie," then 11, loved to visit him and play with the radios. Then in October 1956, Israel, France and England waged war against Egypt over the Suez Canal. Mr. Cohen's parents pulled him out of school after another Jewish boy was injured. His mother, a British citizen, was placed under house arrest. His father's business was "sequestered"—effectively taken from him—and he wasn't welcome at his own office. In May 1957, the family left on a plane bound for Europe. Mr. Cohen still remembers his father crying on the plane. "There is nothing left here," he recalls his mother saying. "It is all over." In the late 1950s and early 1960s, Jews continued to pour out of the Muslim countries. When Desiré Sakkal and his family left Egypt as stateless refugees in 1962, he says, "there were very few Jews left." Stranded in Paris in a hotel, Mr. Sakkal's little brother was diagnosed with cancer, and he still remembers how his parents went to the hospital every day. The brother died a year later in New York, at the age of 10. Mr. Sakkal went on to found the Historical Society of Jews from Egypt, which seeks to recall the life left behind. The Six-Day War of June 1967 brought some of the most violent anti-Jewish eruptions. As Arab countries faced defeat by Israel, they turned their rage on their own Jewish residents—what remained of them. In Egypt, Jewish men over 18 were rounded up and sent to prison. Some were kept for a few days. Others, like Philadelphia Rabbi Albert Gabbai, a Cairo native, remained imprisoned for three years. Rabbi Gabbai was only 18 when he was thrown in jail, along with three older brothers. He still remembers the cries of his fellow prisoners—Muslim Brotherhood members who were being tortured—echoing through the jail. He and his brothers feared that they were going to be killed. After three years of "despair," he says, they were driven to the airport and escorted to an Air France flight. Mr. Cohen, who left Egypt in 1957,grew up to become a pioneer in European venture capital and private equity. In recent years, he has worked to develop the Palestinian private sector. He believes that the focus on Jewish-Arab refugees could spur the Arabs and Israelis toward peace. "There are refugees on both sides, so that evens the scales, and I think that it will be helpful to the process," he says. "It shows that both sides suffered the same fate."